Printed from http://www.bodytalksystem.com//learn/news/article.cfm?id=1052 on Apr 22, 2019. Our founders, John and Esther Veltheim, are once again opening the floor to any and all questions related to BodyTalk, health, the Life Science courses, and/or questions about the spiritual process through the Livestream chat format. This time, the floor is open not only to Members, but also to Non-Members and the public. This is a great opportunity for Practitioners to encourage their clients, friends and family to participate in an open Q&A. It also allows all of you who love BodyTalk and the Life Science courses but have no need for Membership to connect with the community and join the discussion. John and Esther would like the format to remain very open. 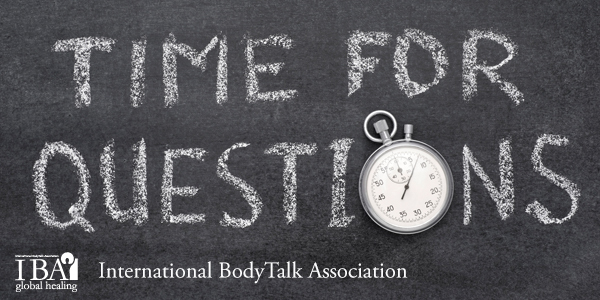 Questions can be on any subject, although John is encouraging that the Q&A begin with all your BodyTalk- and health-related questions. In the interest of the best use of time and so that John and Esther can most easily understand the questions, they ask that questions be as brief and concise as possible. The simpler and clearer the question, the resulting response will be far more clear for you. If during the Q&A, you feel that your question was not sufficiently understood, you are free to continue asking questions. There is no limit on the number of questions you can ask. Although once again, the more succinct your question, the more straightforward and unambiguous the response will generally be. Special news: For those of you who have attended the previous Q&As, you know that Esther has been hoping to engage with students more interactively. Stay tuned for information regarding interactive video-conferencing courses with both Esther and John.